Bangalore Metblogs » Who were they? It wasn’t the security guard in my office, who said “no problem saar, namma mane hattira ide “( i live nearby)when asked if he needed help getting home. It wasn’t the 3 people riding on one motorbike on airport road who said “aa kade hogbedi, galate agta ide”(there’s rioting in that direction, don’t go) when one was waiting to take a turn from airport road onto the inner ring road. It wasn’t the couple who run the small grocery shop on the ground floor of my apartment complex. It wasn’t the man at the pizza chain who informed me that “we are closed today because of law and order problems”. It wasn’t the autorickshaw drivers who were haggling with a passenger over the fare. It wasn’t the cable TV operator who told me that he didn’t want to invite trouble by showing “entertainment” channels. Knowledge capital,hitech city,cultured city…..all crap. In every society, there is always a section which reveals an animal instinct that knows no discipline, grace and concern for life. But as not every German is a Hitler nor every Hindu a Narenra Modi, I think Bangaloreans as a whole are one of the most peace loving and adjusting people. The history of the city is a testament to the fact. I strongly disagree with Mr.Sekar’s comment here as it is quite a simplistic judgement of a city based on the happenings of a single day. And pray how does being a hitech city relate to yesterday’s events? There are around 3 lakh people involved in IT/BPO. But the population of the city is over 60 lakhs. You cannot suddenly wish these people away and assume they do not exist. What happened yesterday was a major collapse of the administration and police force. Period. And I would not be surprised if the same happens in Chennai and Mumbai if something were to happen to Bal Thackeray and Rajnikanth respectively. Let us NOT try to forget these heinous atrocities. Let’s REMEMBER them and educate who ever we can around us to prevent it from happening again. Anyways you can bet Bangalore government officials will do nothing more than warming their seats over this matter. Personelly I think it was a manifestation of a grass root level Kannada disatisfaction at the state of Bangalore and of Karnataka. Quiet similar to the time when Shiv Sena started to gain in Bombay many years ago. The worst is still to some I think. I’m saying this without any bias against the city, I quiet like Bangalore. It’s just my opinion. Er Sheky… don’t go to Germany or anywhere in Europe during football season. What a sad day for a city known to be peace loving? what an insult to the dear departed who was out and out a gentleman! Did at least one of these people know WHY they were indulging in this kind of behaviour? I agree with Akshay that this is a manifestation of some kind of deep rooted resentment that is waiting fora let-up, and any occcasion would do. What a way to disgrace a solemn occasion! Suyog, agree with you on this. And speaking of grassroots resentment, I really haven’t been able to see any of it. One would expect it to be present in a visible manner, but surprisingly, its not, atleast on a day-to-day basis. Ambar, this was a very nice way to present the facts. And what I wanted to say, Usha has said. 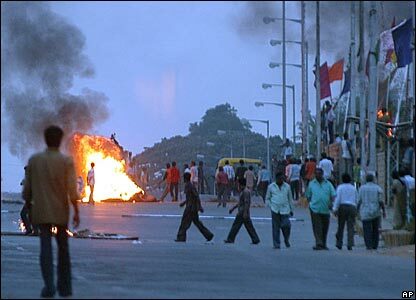 Mobs and riots are not new to India. And the only possible cure for this disease is to eradicate illitracy. But as long as corrupt politicians exist, they will always want the majority of the citizens to be illetrate, so that they can lure them into political battles and also since they are easily lured when some politician speaks of the good of the farmer/poor. What they do not realise is that they are in no way benefitting from them by their false promises. As was expected, the karnataka politicians have now started battling it out against the present governement for mis-handling the situation. SO we can very well guess that this was no unplanned incident, instead was a cunning plan of the opposition parties to encourage mobs and arson on the streets so that they can later blame the government and bring it down. It is a sad world of politics and i do not see the situation improving unless some of the educated individauls like those who have posted comments on this thread and more outside do not stand up to save their country from a certain death! The REVOLUTION is Coming. Can you see it. If you think that educated individuals must enter politics and steer this country away from doom, please visit http://www.lokparitran.org/ and support our cause. Till now noobody has answered it. Whoever they were, whatever their motives or incentives were, whoever were backing them or organised it, the act is shame, disgraceful, condemnable. Wherever this kind of violence happen, is condemnable. Though, this incident is shameful, I guess Bangalore is more than confident to match and recover. At the same time ready to take this blot and move on, remembering that it WILL NEVER BE ALLOWED TO HAPPEN AGAIN. Suyog, defending the shame by pointing out other’s fault, is good for indian politicians not for sensible and confident people. Some light comments are not to be taken seriously. Nobody can claim that Bangalore is a bad city. Bangalore was there even before IT, and I think it was the Bangalore only that made indian IT boom possible. If somebody is shaky enough to wilt in just few blows then he/she should still need to learn more. About the resentment, its everywhere, in every indian state, city, town and village. So, are there enough proof that these riots were result of these sentiments? I belong to a small town and I know from my experience, this kind of behavior doesn’t result only due to strong sentiment. People avoid violence till the last moment. Sentiments results in violence only when there is political backing or somebody is readily acting as facilitator. Be is related to the huge diference between rich and poor or be it religious difference, people earning their wagers daily loose it when violence happen. For Karnataka, literacy rate is on higher side compare to other indian states. State can boost of huge number of colleges, institutes and also have benefitted most by industrialization. Just now, I was reading about some grassroot initiatives taken by some NGOs and other institutes in Karnataka. No where, I was able to notice that people attach ‘Kannadiga’ pride with anti feelings to the modernisation or industialization. Though, I agree that there will always be one sector of society of will feel being left out of development but if this is enough to lead to violence then all the cities in India should be burning. Now, what I am able collect from other news is that this riot shame appears completely be the result of political dog fight. I can’t comment on a chief minister who has shown his opportunistic behaviour for grabbing the seat, not the former CMs who had resorted to changing name of the city or changing the party as ritual. Its common in many parts of India and it always amout to shame. kk ~ I was watching recurring images on TV( horrendously graphic in nature) about policemen being beaten up and so on! What was more shocking was to see the same guys smiling at their achievements throwing their hands and shirts back and cheering with every bout of violence.Their agenda was solely violence and vandalism. Not to be mistaken for grief or frustrations. Its the anti-social elements of the city my friend! Ones waiting for the slightest of causes to go rob that shop nearby. Or kick up a raucous. !A blotch to the city.